PYRAMID LAKE IS ON FIRE! HAD THE CHANCE A FEW WEEKS BACK AT THE PLEASANTON FLY FISHING SHOW TO WORK IN THE HARDY BOOTH. WOW, ARE THESE RODS THAT HARDY MAKE SOMETHING SPECIAL. THE ZEPHRUS BY FAR IS MY FAVORITE ROD AND IT ALMOST CASTS ITSELF. ITS NOT REALLY FAIR BUT SO GLAD TO BE ABLE TO HAVE THESE RODS, ZEPHRUS, WRAITH AND THE FENWICK RODS, WORLD CLASS, AETOS AND THE NEW HARDY GLASS IN MY ARSENAL NOW AND MOVING FORWARD INTO THE FUTURE. Earlier this month I had the opportunity to fish a small lake located 45 miles North of Santa Barbara. The fishery is fairly new, in only the second year of existence, and is located in the rolling hills above a little town in California’s wine country called Los Olivos. 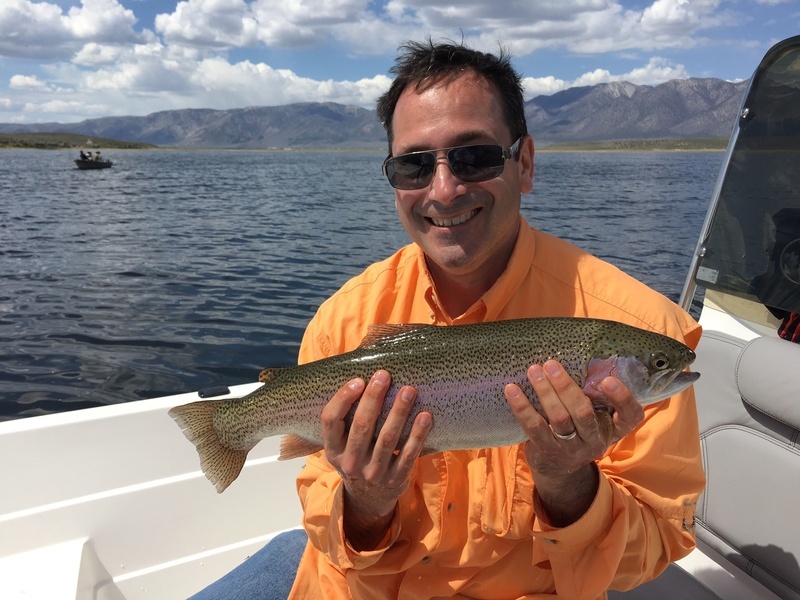 What the lake itself lacks in size is made up for very quickly by the size of the rainbow trout it holds. On this trip the fish caught averaged about 17", with many fish in the 20" inch range. My first fish to the net while fishing intermediate sinking line and a black and red leech pattern was a whooping 22" and well into the 5 pound range. This adventure started on a Saturday morning in a parking lot at a country store in Los Olivos. I was there to meet Ken Lindsay, the owner of the fly fishing store called "The Fisherman's Spot" located in Van Nuys. This is one of the best fly fishing stores I have seen and you should take advantage and visit this store in the near future. Ken and I were to meet one of his store’s customers and brain child of Lago Fig’s existence, Lake Manager, and local ranch owner Rick Paaske. From there we were escorted only five minutes away to his beautiful ranch nestled in the foothills outside of town where I was pleasantly surprised at my first glance at this beautiful little Stillwater fishery settled in a small steep canyon surrounded by green grass, beautiful oak trees. As we all parked - there were 6 anglers in our group - I popped out of my truck and unloaded my gear very quickly. Ken said, “Slow down Ernie”, to which I replied “You know me better than that and how passionate I am about my Stillwater fly fishing”. I was quickly in the water with four rods in hand on board of my super fat cat pontoon , one intermediate line, one sinking line type 4, one floating line for indicator fishing and on other indicator rod for deep water indicator fishing with a sliding indicator for water over 15 feet deep. As I kicked away I could hear the anglers ask, “Wow, who is this guy?”, a question I would hear a few more times throughout the day as the fishing became better and better using midges under an indicator. As I kicked away stripping line off of my intermediate line rod I was surprised to see just 30 feet or so off the shore line the water was well over 15 feet and dropping fast into the 20 to 25 foot depths. Wow, I said to myself, I will have to let this intermediate sink for a while to get down closer to the bottom so I slowed my kicking down to a crawl and casted out 60 feet of line. No more than 2 minutes later my rod loaded up and I was on a nice fish and as quickly as the fish loaded the rod the fish disappeared back into the depths. I was not disappointed, not by a long shot. Success so soon was more than I could have asked for.